After a six-month installment along Philadelphia’s Kelly Drive in 2017, Big Bling by artist Martin Puryear will be traveling to MASS MoCA in North Adams, Massachusetts. Originally planned for disassembly and its materials donated for other uses, Madison Square Park Conservancy working with MASS MoCA came to a last-minute agreement to bring the artwork to a corner of New England known as ArtCountry, in northwestern-most Massachusetts. MASS MoCA is currently working with Puryear to site and install the colossal work. One of the largest museums of contemporary art in the United States, MASS MoCA will become the third location that Big Bling has called home. The sculpture was originally commissioned by Madison Square Park Conservancy and first exhibited in Madison Square Park, NYC from May 2016 through April 2017. It was then brought to Philadelphia through a first-time collaboration between Madison Square Park Conservancy and the Association for Public Art (aPA), and installed along Kelly Drive between Fountain Green Drive and the Connecting Railway and Girard Avenue Bridges from June to November 2017. 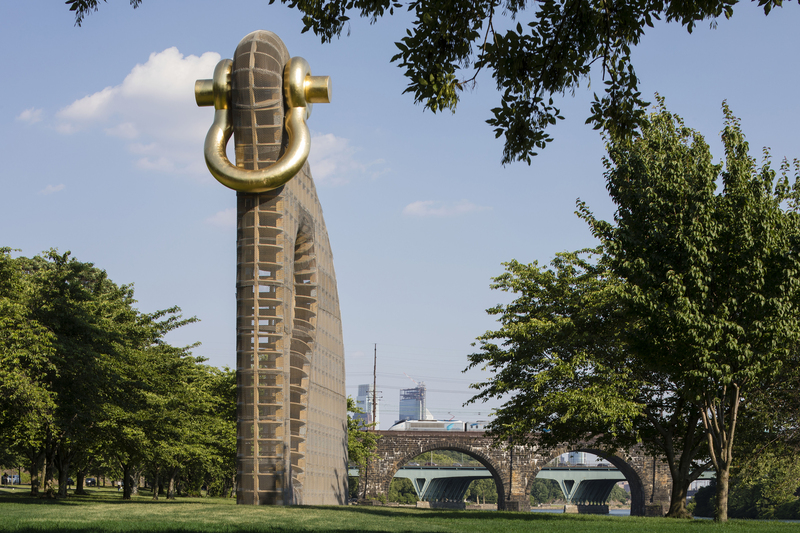 Big Bling was experienced by hundreds of thousands of joggers, cyclists, rowers, and motorists along Kelly Drive, many of whom marveled at the colossal, animal-like form with a gold-leafed shackle that had risen along the Schuylkill River. Philadelphia is also home to one of Puryear’s earliest public works, Pavilion in the Trees (1993), which was commissioned by the Association for Public Art and constructed of materials similarly found in Big Bling. While the sculpture was in town, the Philadelphia Museum of Art displayed a recently acquired intaglio print by Martin Puryear, Untitled (State 1), and The Print Center exhibited Martin Puryear Prints: 1962 – 2016, guest curated by Ruth Fine. More information about Big Bling and its time in Philadelphia can be found here. Brooke Kamin Rapaport is the Director and Martin Friedman Senior Curator of Mad. Sq Art at Madison Square Park Conservancy in New York City. Dr. Kellie Jones is Associate Professor in Art History and Archaeology and the Institute for Research in African American Studies (IRAAS) at Columbia University. Michael Hurwitz is a fine furniture designer and friend of artist Martin Puryear. Martin Puryear is the artist who created Big Bling. He is heard on archival tape courtesy Art 21, Inc.